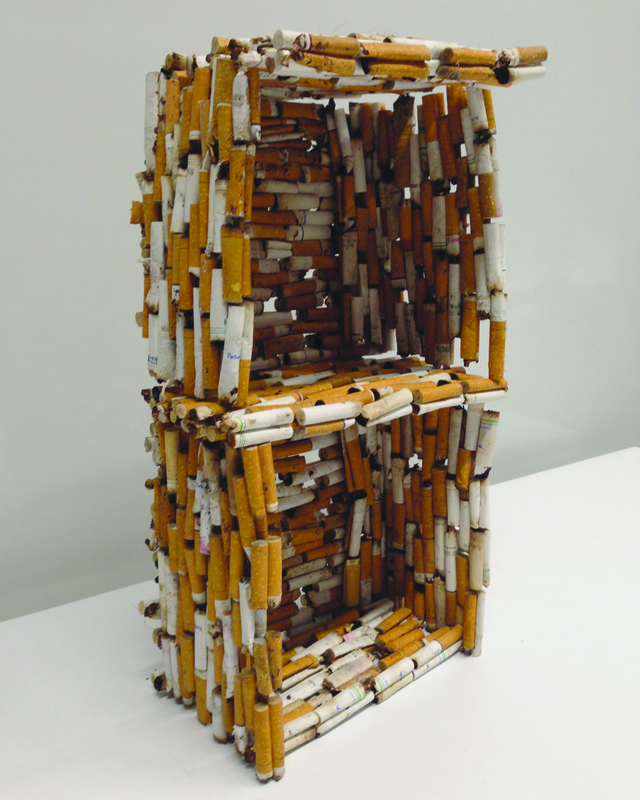 For Bridge Project 4, I constructed a house out of cigarette butts and Elmer’s Glue. After establishing my concept, I went outside and began to collect cigarettes. Once I had a couple bags of butts, I experimented with methods of construction. Finding a method of construction introduced challenges, such as how to create a flat building material out of cylindrical butts, and how to maintain the look that the house was only made from cigarettes; without visible binding and no underlying structure. I figured out that by creating “bricks” by glueing two similarly-sized butts together, I could create a unit that wouldn’t role, and could by layered, offset, with other bricks to create a “wall unit”. With these wall units, I assembled the house. Since coming to New York, I’ve been interested in how I, along with a lot of my peers, romanticized coming to New York City and what life would be after high school. Once coming here, we see that there is a disparity between how we thought things would be, and how they are. It turns out that our Dream House, our Dream Life, is made of cigarettes, and it crumbles underneath our unassuming ideals. My cigarette house is a physical representation of this disparity.